Hefei Fanyuan Instrument Co.,ltd offer We specilized in providing Texitle &Garments ; Plastic Testing Euiqpment ; Geosynthetic Testing Euiqpment Footwear Testing Euipment . Included : Ring Stiffness Tester,Thermal Cycling Tester ,Impact Tester , HDT/Vicat Tester ,Hydrostatic Pressure Tester ; Melt Flow Index Tester etc ^. Included :Leather Tester ,Shoe Tester ,Sole Tester,Abrasion Tester etc ^..
All of testing instruments manufactured by us are well-known throughout China and more than 50 countries abroad for providing superior value and performance and are backed by industry-leading warranties, such as Bangladesh, Colombia, Egypt, Germany, India, Indonesia, Iraq, Ireland, Lebanon, Libya, Mauritius, Mexico, Pakistan, Saudi Arab, Serbia, Spain, Italy, USA, Vietnam, and so on. FYI has more than 20 technicians and engineers, specialty in computer technology, mechanics, integration of mechanical and electrical industry, etc. We have established ourselves as one of the leading manufacturers and exporters of quality testing instruments. we have gained a reputation for excellence among our customers and peers. Efficient distribution systems and timely delivery schedules have endeared us to our customers spread around the world. As a strategic partner, Dowell Science and Technology (HK) Co., Ltd. start to cooperate with FYI to penetrate global market by finding agencies in diverse nations or directly sell products to end users from the year 2006. 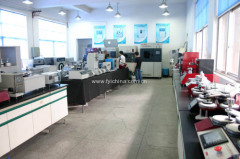 To receive our latest updates or hard copy, or request a quotation, service question or product issue contact sales@fyichina.com.cn and they can help you ! Please view our website and you can get our online catalog ! Competitive Advantage: WE PASS SGS AUDITED SUPPLIER FOR GLOBAL CE CERTIFICATE FOR EUROPE MARKET. PROFEESIONAL TECHICAL TEAM , HIGH QUALITY PRODUCTION AND TIMELY REPLY ! GEOSYNTHETIC &GEOTEXTILE TESTING INSTURMENTS .